A new animated collection is coming on dvd, Reeltime Picture’s next dvd is The Paul McGann Years, TITAN collectors can get hold of some swanky artist proof versions and the next classic blu ray special edition will be Season 10 from the 3rd Doctor era. We’ve been looking forward to checking out both the story and the animation quality of this recently released 2nd Doctor story. Are the Macra a worthy new monster but more importantly, why no “rough and tumble” scene? Next week our review will be the Torchwood story – They Keep Killing Suzie (we really are doing it this time). Until then have a great week and remember – Allons-y! 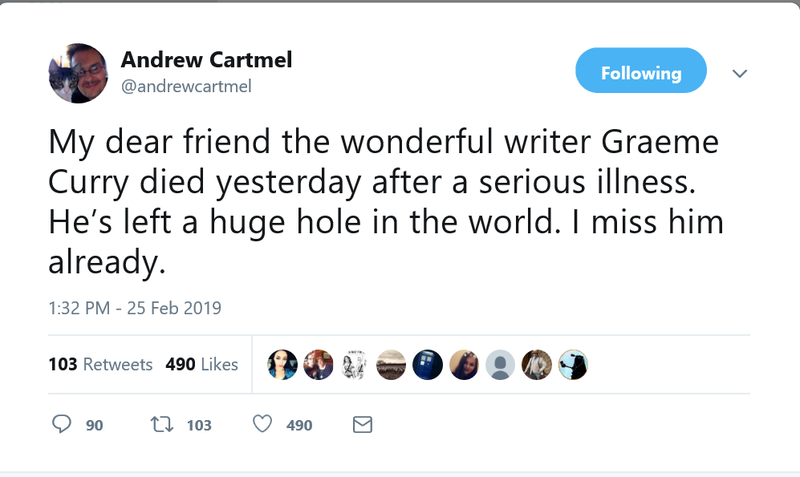 Script Editor of “The Happiness Patrol”, Andrew Cartmel, shared the sad news on Twitter a few weeks ago that the writer Graeme Curry had died and I felt a real pang of regret and sadness when I heard that news. Graeme Curry was just 54 and it seems a crying shame to lose a writer at that age. He contributed one story to the classic Who canon “The Happiness Patrol” in 1988. “The Happiness Patrol” was broadcast as part of the 25th anniversary season. It seems a fitting time to review this story which divided its audience into lovers and haters. Doctor Who in war with Planet Maggie screamed the newspaper headline when Sylvester McCoy told the Sunday Times newspaper in 2010 that there was an agenda to bring politics into the show. The outraged tone of the article, using words such as a ‘cabal’ ‘anti-conservative propaganda’ ‘fomenting anti-Thatcher dissent’ probably says more about the newspaper’s leaning than the extremity what was actually happening at the time. Reading the Telegraph Sylvester McCoy is quoted as saying they brought politics into the show ‘deliberately ‘but “very quietly” it seems to me his personal expression is taken as representative of some conspiracy. It seems a bit of a grey area. The director Chris Clough considers there was an anti-Thatcher agenda and script editor Andrew Cartmel didn’t discourage the writer from using Margaret Thatcher as an inspiration for writing Helen A. However, Graeme Curry insists he wanted to write a story with an interesting and credible villain, not necessarily a satire of Margaret Thatcher. Whilst Sheila Hancock may have based her interpretation on the politician, to only see Helen A as a caricature of Margaret Thatcher rather denigrates the politician but also the fictional character. Margaret Thatcher was greatly influenced in her policies by a book called The Road to Serfdom. Written by an Austrian economist Friedrich Hayek, it warned of the dangers of tyranny that result from government control of economic decision-making through central planning. So, Thatcherism (such was the influence of the Iron Lady that she was given her own term for a political philosophy) represented a belief in the free market and a state which wasn’t planning and regulating people’s lives. “The Happiness Patrol “if you think about it properly is the opposite of allowing people to take responsibility for their own lives. The people of Terra Alpha don’t have many free choices. I’m not defending Margaret Thatcher necessarily. In retrospect, for me, privatisation of all the public utilities the state-owned such as gas, telephone, rail services, British Airways s etc I see as trading all the country’s wealth for a short-term gain. The state sold off all their assets and you can then only use all that money once unlike owning something that makes money and reinvests. How many citizens really became richer in the long term because they brought shares in these companies? Graeme Curry does put in subtle nods to Margaret Thatcher’s ideas. The rolling back of state welfare was a key policy. The justification by Helen A ‘that her policies were “For the good of the majority. For the ones that wanted to be happy, who wanted to take the opportunities that I gave them” reminds you that also the least able does deserve to be supported. Whilst it’s fine to be rewarded for using your initiative and not relying on the “nanny” state. (highlighted when Helen A rewards Silas P, a member of her secret police, “I like your initiative, your enterprise” a badge for catching 45 killjoys) not everyone has the capacity or opportunity. The Doctor persuades “the drones”, who labour in the factories and mines, to stop working and rise up in revolt at one point, an echo of the miners’ strikes and printers’ disputes during Margaret Thatcher’s first two terms in office. The miner’s strike was a particularly bitter dispute and the loss of jobs from the mine closures would devastate communities which would take a generation to get over. Margaret Thatcher was a tough politician, proud of her humble roots as a grocer’s daughter, explaining to the public the simple comparisons of managing a budget like a housewife. Helen A herself is far more sinister. The writer puts in ideas more audacious and disturbing than any democracy we have in the United Kingdom. In broad terms “The Happiness Patrol” examines the tools of Helen A’s dictatorship regime Her idea of population control of 17% is utterly monstrous. The all-female Patrol, which Ace auditions for are for all their bright colours a death squad. The Kandyman is a Dr Mengele experimenting on his victims with ‘sweets that kill’, the victims covered in a tube smothered with fondant surprise reminds me of a gas chamber. Harold V, formerly known as Harold F, also suffers electrocution. Sheila Hancock is a wonderful actress who manages to capture the ruthlessness of Terra Alpha’s leader. There is something horribly cold as she portrays Helen A’s childlike delight at fondant surprise or that we find out that she records and watches all the executions. It is a shame that the object of any softness is a pet called Fifi which to be fair is fairly unconvincing as a prop but Sheila Hancock really sells the affection she feels for it and her sorrow at the end feels real. PRISCILLA: I did a good job, and then they put me on this. It’s not fair. I know the streets. I’m a fighter. ACE: No, you’re not. You’re a killer. I love the twofold meaning we get with the language used which plays with images of innocuous things such as the waiting zone, sweets, happiness, but which also has a menacing and deadly meaning. You may see the pink wigs the Happiness Patrol wear as ridiculous but the world that Helen A wants is held together only by force. It struck me how everyone who lives on Terra Alpha is busy acting out a role and Graeme Curry says he wanted to write about the falseness, saccharine sweetness and brashness of American culture and in this respect, the script really works. One of the most powerful bits for me, which is almost handled as an aside, is seeing Daisy K without her wig at the end as Helen A’s regime falls. The only part of the script which falls down is the dreary subplot with the tunnel dwellers who are difficult to understand through ill-fitting face masks and it’s hard to work out what they actually want or add to the story. HELEN A :And don’t forget, when you smile, I want to see those teeth. It’s such a good cast otherwise with Georgina Hale-(Daisy K), Rachel Bell( Priscilla P), Lesley Dunlop(Susan Q ), Harold Innocent (Gilbert M), John Normington (Trevor Sigma) It feels as if this company of actors really made the most of the script even where there may not have been lots of individual scenes for each of them. I particularly love the different types of women that we get to see through the Happiness Patrol and it’s a sign of changing times in the 1980s whereas an audience we are seeing women in positions of power in a regime. Having the male two guards talk about their weapons and how the women get the best guns and better jobs was a welcome little twist on the normal status quo. The only actor who I felt wasn’t as strong as the others were Richard D. Sharp as Earl Sigma. As a character, he felt the least drawn in. HELEN A: I think you should watch this, dear. You may find it instructive. The other male characters Joseph C (Ronald Fraser) and Gilbert M (Harold Innocent) were very good, laid back and sardonic by turn. There have been suggestions that there is a gay agenda running through the story ( well there is a lot of pink in this story one way or another) If you believe the story is an attack on Margaret Thatcher’s policies then there may be a justification for the claim as the inclusion of Section 28 clause of the Local Government Act 1988 stated that a local authority shall not “promote the teaching in any maintained school of the acceptability of homosexuality as a pretended family relationship”. Anyway, the surprise of them together in the escape shuttle tickled me. Graeme Curry must have considered that the ultimate revenge on Helen A as she drove her husband away. 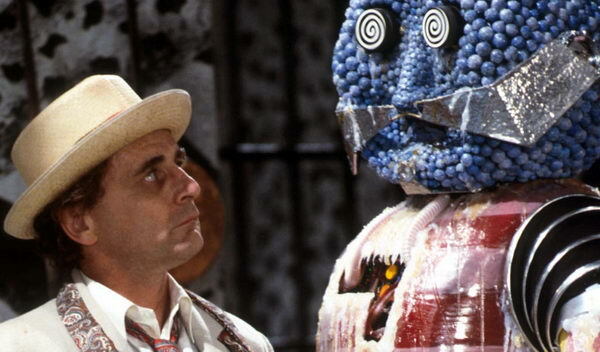 Of the regulars, I do feel a bit mean to say that Sylvester McCoy is fine but not exceptional. Much vaulted The rooftop scene with the two male snipers is good but there are parts where he pronounces his lines at times quite deliberately and it’s distracting. It’s not naturalistic. He is adept at the black comedy of the script but doesn’t quite deliver on the drama. I’m not sure why as he does in other stories. There are times such as his singing of As Time Goes By which is truly awful and the scene where he is pretending to be happy in front of the happiness patrol seems a bit hysterical and overblown – but I suppose he can’t use a gun against them. Sophie Aldred gives a solid performance as the sulky, angry teen Ace although she does become a bit shouty against the tunnel dwellers at times. Her honest interactions with Susan Q, are a highlight and Lesley Dunlop manages to bring real pain to her part that I personally loved. ALEX: Don’t see any women doing roof duty. Women always get the better jobs. DAVID: Women always get the best guns. I have a real soft spot for the Kandyman. As a waspish psychopath spitting venom with every line he is a marvellous creation and yes, I know he looks like a giant Bertie Bassett sweet feast which is slightly unfortunate. However, I enjoy the banter he has with his creator Gilbert and the hate-hate relationship they share. It amuses me a lot that the chairman of Bassett Foods wrote a letter of complaint to John Nathan Turner regarding infringement of copyright because of the way the Kandyman looks. I Imagine they worried their little consumers being absolutely terrified by the imagined nightmares that voice could bring! The character is a complete antithesis of sweetness and I love the contrast of the way he looks and sounds. KANDYMAN: Just because Helen A prefers my ugly side doesn’t mean I don’t care, does it, Gilbert M? Gilbert M! GILBERT: Oh, no, of course not. I said at the start that this story is a bit Marmite for people and despite an intelligent script what is a bit of a disappointment of THP is the execution of what this world looks like. 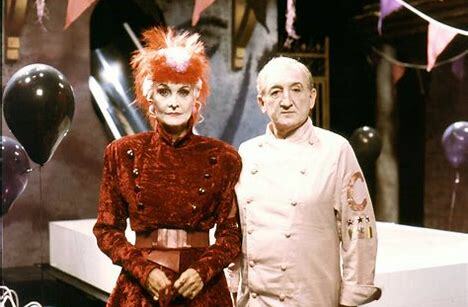 Visually the Kandy kitchen is probably my favourite set with the large oven and pipes reminiscent of a nightmarish fairy-tale but the street scenes which are darkly lit do look like a studio. From what I remember from the feature on the making of the episode the production team weren’t looking for realism. But I would have liked maybe one line saying suggesting the people lived in a dome or just something to explain the artificialness of the surroundings. “The Happiness Patrol” is like a batch of chewy toffee. It’s either a sweet sensation that you can decide to enjoy slowly pondering on its various notes or it just gets stuck on your teeth which frustrates you. Happily, my own personal preference is it’s a little sweet gem which I don’t tire of watching. What are your thoughts on “The Happiness Patrol”? Post your thoughts on here or on Twitter. Let’s talk. What do you fear? Doctor Who has a long history of playing with our primal fears over the years, the monster under your bed, spiders, mannequins, pollution, cacti, the list is endless. Indeed, a wise man once said that ‘We all have a universe of our own terrors to face’ and in Ravenous thus far, the Doctor is having to face up to his. When we left him, Liv and Helen, they were marooned on a barren planet, beset by some very hungry (you could even say ravenous) monsters from Timelord legend. As Ravenous 3 opens, we change focus, Moffat like, to visit a Gallifreyan research station somewhere out in deep space. As we’re informed by screeds and screeds of expository dialogue, the station is searching for an alternative energy source for their home planet. However, they have also discovered something which could bring about their destruction. Deeptime Frontier immediately assuages any notions the listener may have that we would follow up the chilling, atmospheric haunted house of Seizure with a similarly atmospheric battle for survival in the intergalactic wilderness. Instead, we get a fairly business as usual, base under siege story in which we learn more about this series’ titular big bads. Over the years, Big Finish has had a few stabs at creating their own memorable monsters (perhaps with a view to keeping licensing costs down), the Eminence, for example, faced Doctors 4-8 over a number of plays but amounted to little more than some evil dust. Similarly, well-meaning futuristic plague doctors, the Viyrans have faced various Doctors but were never particularly memorable. Perhaps it was a mistake on Big Finish’s part to pit both of these creations against the Daleks. But perhaps the real threat of the Ravenous series is fear itself. Everything that happens in Deeptime Frontier is the result of various character’s fears. The fear for Gallifrey’s future, the fear of the Timelords themselves and the fear of the Ravenous all play a part in inciting the various dramatic moments that keep this play ticking along. The cliffhanger ending that leads us into the next story also hints at fear forcing the Doctor and an old foe into an unexpected bargain. It is in these moments that the overall theme of the Ravenous arc begins to emerge, (9 episodes in) and hints at something far more interesting than Gallifreyan research stations and the ever-looming threat of the Time War. 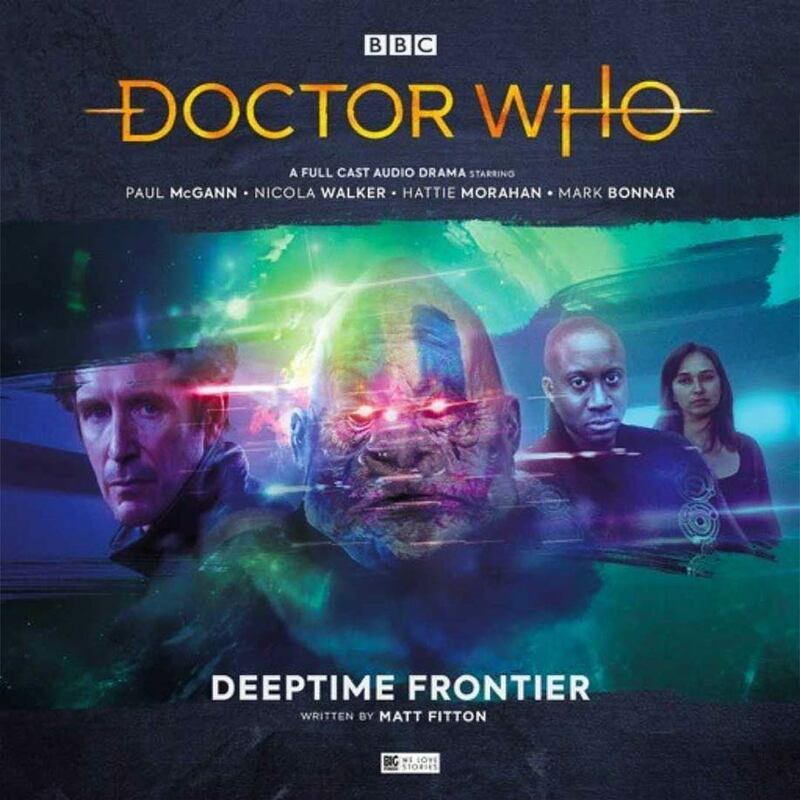 Ultimately though, Deeptime Frontier is an inauspicious start to this set of adventures, at its worst it’s the sort of mythology driven Doctor Who that feels tremendously bogged down with talk of Rassilon, the old times, dark chronons, prison dimensions and the Eye of Harmony. However, it’s at its best when writer Matt Fitton explores fear and our responses to it, which just about raises the script above some stock-in-trade base under siege clichés. It’s something of an 8th Doctor heavy year for Big Finish as they celebrate their 20th anniversary of producing original Doctor Who audios. Alongside the ongoing Ravenous and Time War arcs, we have a brand new series of adventures for him and beloved companion Lucie Miller (Sheridan Smith) and he’ll make an appearance in an upcoming War Master boxed set. He will also have his own role to play in the hugely ambitious crossover Legacy of Time in which he’ll team up with Professors Song and Summerfield. Arguably, we wouldn’t have had 20 years of Big Finish without Paul McGann’s Doctor. It was the prospect of new adventures for a new Doctor that first attracted me to Big Finish as I followed the adventures of him and Charley from the R101 airship to the Divergent universe and beyond. There was a blank page for this particular era which allowed Big Finish’s writers to the types of original, inventive Doctor Who stories that really made their name. How lovely it is then to have John Dorney’s Companion Piece, the second story in the Ravenous 3 boxed set which is as heartfelt and thrilling and funny a tribute to the 8th Doctor era as you could ask for. In true Doctor Who style, Companion Piece begins right at the end of a previous series of boxed sets whilst simultaneously taking place a third of a way through the following one. Thankfully, that’s nowhere near as confusing as it sounds. The Nine, one of the villainous Eleven’s previous selves has captured one of the Doctor’s friends and, due to a mixture of kleptomania and obsession is determined to capture them all. And so it is that we have the Doctor’s current companions Liv and Helen locked in a cell with his first companion Charlotte Pollard and future companion Bliss. The four women have to learn to work together, with some remote support from River Song, to defeat the Nine and return everyone to their correct time zones. India Fisher, Nicola Walker, Hattie Morahan, Alex Kingston and Rakhee Thakrar united to defeat John Heffernan’s The Nine! 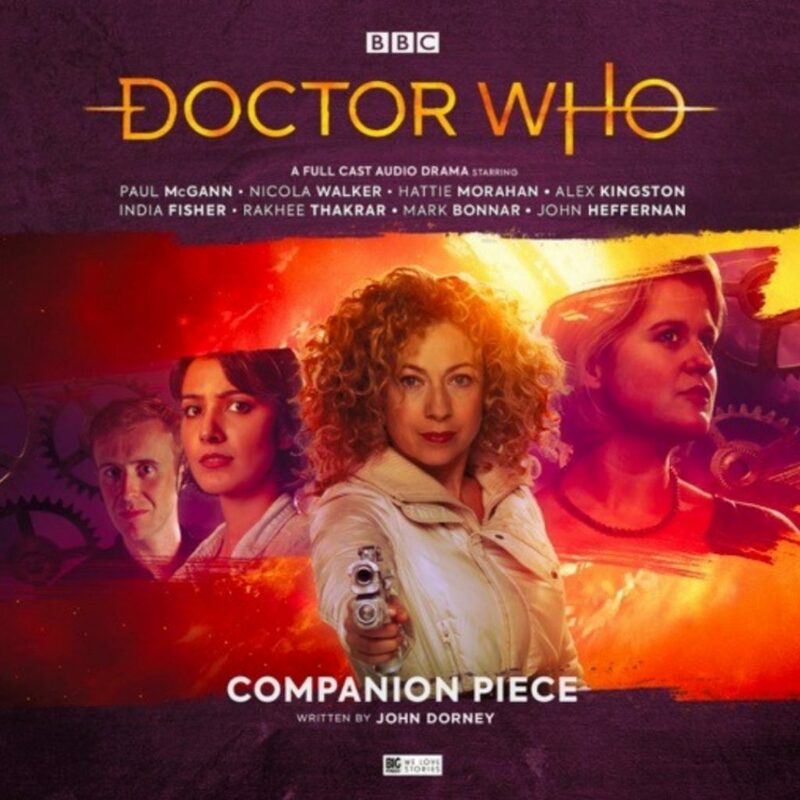 Essentially, Companion Piece is a multi-companion story, and much like multi-Doctor stories a lot of the joy is in how these characters interact with each other. There’s mutual respect between Liv, Helen and Charley whilst a seemingly out of her depth Bliss has a brittle, bickering rapport with Liv. Nicola Walker and Rakhee Thakrar have great chemistry together which ensures that these scenes sparkle. It helps too that John Dorney has crafted a script full of memorable one-liners (“Not without a shovel” is a killer), knowing references to arguments over which companions are canonical and, because River’s involved, some delightfully suggestive situations that may stay in your mind’s eye for quite some time. This is a deceptively simple, breathlessly paced jailbreak story that only ever pauses to make wisecracks about the obsessiveness of collector culture or the stringent rules fans apply to canon (“The penguin definitely counted”). As much as this is a tribute to the 8th Doctor era, it’s also a love letter to the role of the Doctor Who companion, it’s hopefully not considered a spoiler to say that this isn’t a story about the Doctor riding in at the last minute to rescue his friends. Companion Piece is about those brilliant friends doing it for themselves. It also manages to cue up a couple of upcoming Big Finish releases along the way, and slot in some crowd-pleasing cameos, none of which weigh down the action or will be spoiled here. Next week our review will be the 2nd Doctor story – The Macra Terror. Until then have a great week and remember – Allons-y! For the next four months Big Finish have given us Torchwood listeners a real treat, we’ve got all new adventures featuring the return of popular/classic Doctor Who monsters. Night of the Fendahl is just the first, we’ve got The Green Life featuring the infamous maggots this month as well as the return of Jo Grant/Jones, Slitheen and Autons to enjoy all the way up to June. As the title suggests, Night of the Fendahl features the return of the Fendahl, made famous from the 1977 Tom Baker story, Image of the Fendahl. Written by Tim Foley and starring Eve Myles, we are in for a real treat! Right from the get-go, this is a very adult release. I liked the little note at the beginning of the story, presumably something that will now feature all the way through the range that Torchwood contains adult themes. Surprisingly for the television series, the subject of horrific snuff-films wasn’t something that it explored and as a result, this story feels topical thanks to the recent movements from campaigners for better equality. I’ve always been a fan of the 1977 television adventure. I’ve always thought it was quite creepy if a little confusing in places. I’ve always been a fan of the Fendahl and there is some interesting Time Lord mythology to explore there, even if the show never did a follow-up. 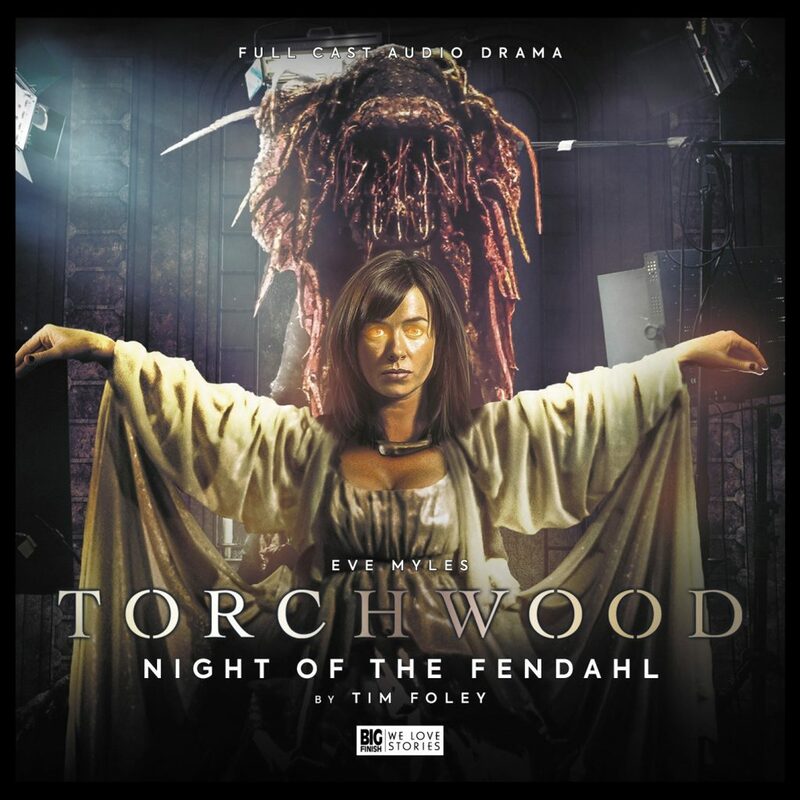 In fact, the Fendahl had always been a villain I thought would be great for Torchwood. Others include the Mara, Autons, Slitheen, Sontarans and the Berserkers from Sarah Jane Adventures. Already, this release had me excited. I was very impressed with the world that Foley managed to create. Setting it in the original location was a stroke of genius too and it was nice to hear what had happened to poor Colby, the only scientist there to survive the first time around. But it was nice to return to Fetch Priory and the various locations that that story took place in. Foley’s characters are also thoroughly despicable, including Ged, Derek and Marco, cleverly named Marco Fendhalman. Each one border on the obscene, with Derek, determined to make Gwen take part in as little clothing as possible. Each character their comeuppance nicely and strangely in keeping with the elements that the original television production had set out. It is Phil, played by Eve Myles’ real-life husband, Bradley Freeguard who gives the standout performance from the guest cast. His scenes with Gwen are electric. While he is horrible for taking part in these films, it isn’t as black-and-white for him as it is for the others. He doesn’t want to hurt Gwen, especially when he finds out she has a daughter and it makes him quite likeable in a strange sort of way. Even though he is making these terrible films, you almost want him to survive until the end and get away from Fetch Priory. But this being Torchwood means there is rarely a happy ending. And the ending is suitably chilling as Gwen makes sure he gets what he deserves. What I really loved though was how Foley took some of the groundwork from original Chris Boucher script and expanded on them, particularly the idea of women being exploited, something that is apparent if you want to read that into Image of the Fendahl. The scientists do treat Thea horribly there and it is no wonder they get theirs when she becomes the Core. But there is some humour in this script, neatly placed to balance out the darker tones. Eve Myles is just amazing as usual. Through Big Finish she has delivered a number of stellar performances, my favourite being Katheryn Ellis in Blind Terror: Gods of Frost. But no matter what else she does, I will always see her as Gwen Cooper and her performance here doesn’t disappoint. Throughout the episode, her range is incredible, she goes from being the normal, lovable Gwen, to a slightly sinister version to the Core of the Fendahl, at the drop of a hat. It’s incredible and goes to show what a great actor she is. As long as Eve continues to make Big Finish audios, Big Finish will certainly continue to empty my wallet! Another thing that will strike you about this audio is how good the sound design and music are. 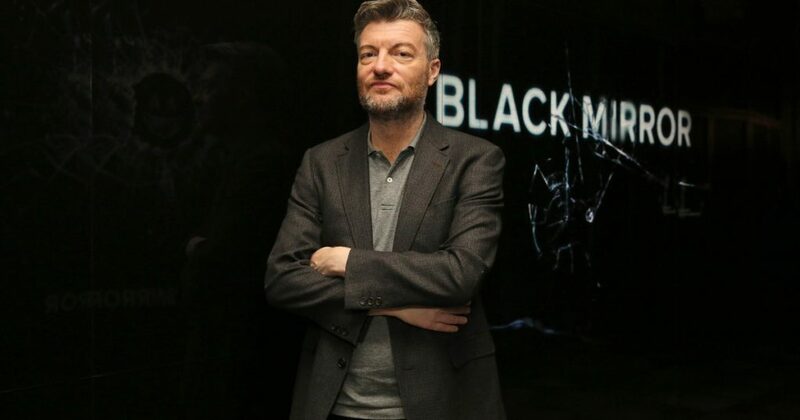 Blair Mowat does a brilliant job on the music front, never intruding on the emotions given off by the superb acting and making sure his score only helps to aid the moment. And the sound effects are suitably disturbing from Mark Hendrick uses new sounds and the established effects from the original to make the whole piece really interesting and exciting. Once, Night of the Fendahl comes to its conclusion, you’ll wonder why it was never a television episode. The visuals from the writer, Tim Foley, tight direction from Scott Handcock, music and sound design and performances all work together to make something truly unique. Even if you aren’t a fan of Image of the Fendahl, I urge you to pick this release up. Not only does it expand on some of the themes from the original, but it also delivers a truly dark and gritty science-fiction drama that deserves to be listened to, sat in the dark, wondering if that is a Fendahl in your speakers or a Fendahl behind you? Even though I begged my parents for the shiny new E-Space VHS boxed set and loved both Keeper of Traken and Logopolis as a kid, I took against Season 18 as I got older. As a cynical teenager and twenty-something, I was rather saddened to see the indomitable Tom Baker in such reduced circumstances, gaunt, tired, and dressed in a costume that often seemed to be wearing him rather than the other way around. One thing that never wavered, however, was my absolute love of The Leisure Hive. I’ve never quite been able to put my finger on why, maybe it’s that memorable Part One cliffhanger, the brilliant score by Peter Howell, the subtle differences of Tom’s performance as the aged Doctor or the mad idea of civilisation moving on from devastating nuclear conflict to operate a tourist attraction. Each time I return to this story, I find something new to enjoy. It’s been recounted numerous times before, not least in the beautiful collector’s booklet included with the set, but let’s run through it again quickly. Season 18 was the first to be produced by John Nathan-Turner and was designed as something of an overhaul. 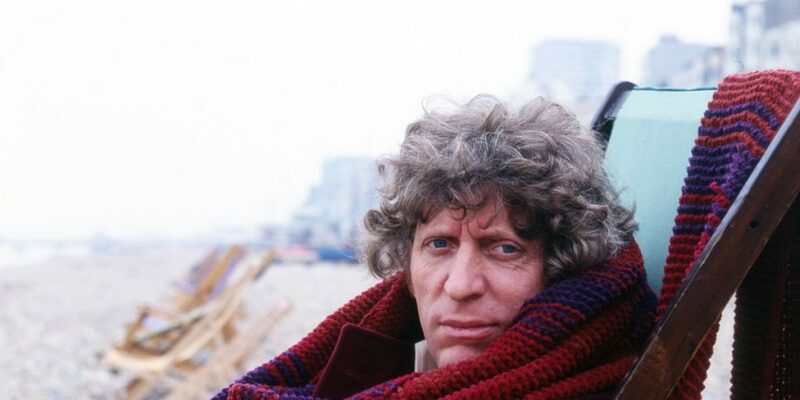 Commissioning a new title sequence, a modern electronic score and a new costume for Tom Baker, JN-T was intent on producing a Doctor Who that was more reflective of contemporary science-fiction film and television. Nathan-Turner’s ambition is laudable and, on a good day, many of these choices breathe life into a show which had perhaps rested on its laurels a bit during the Graham Williams and Douglas Adams era. Unlike the current iteration of Doctor Who, producer JN-T was not a writer, but in Christopher H. Bidmead, he had a script editor who understood what needed to be done to reinvigorate the show and who also had a strong grasp of contemporary scientific thinking and early computing. Together with Bidmead and former producer Barry Letts (hired in an advisory capacity), JN-T set out to tone down the daffiness of his predecessors with stories that were focused more on the science fiction than the humour. Broadly, The Leisure Hive achieves this remit. Coming after the pantomime excesses of The Horns of Nimon, this story about a race of aliens rendered sterile by a brief and devastating nuclear war is a sharp tonal shift. Of course, this being Doctor Who this grim scenario is cheerily offset by flower people and chirruping reptilian gangsters. The ‘hard science’ of tachyonics is handled with rather a light touch, allowing the visuals to do a lot of the heavy lifting for the audience in a way that later stories like Warrior’s Gate, Logopolis and Castrovalva never quite achieve. And whilst we’re on the subject of the visuals, the opening sequence, a sweeping tracking shot across a deserted, windswept Brighton beach is a clear statement of intent by director Lovett Bickford. It’s an incredibly beautiful combination of cinematography and direction which distracts you from the fact that the scene is a bit of padding that purely exists to write out K-9 for the duration of the serial (for reasons which become increasingly unclear as the futuristic, technological plot plays out). In the Behind the Sofa featurette on the disc, costume designer June Hudson laments not being able to realise Bickford’s cinematic vision for the serial. Peter Howell’s excellent score, however, backs up this cinematic ambition, evoking Jean-Michelle Jarre and Vangelis whilst also possessing its own unique identity. Howell just got what 1980s Doctor Who should sound like and whilst other composers may have struggled (Paddy Kingsland’s Mawdryn Undead score comes instantly to mind), Howell’s work is evocative and timely. Whether or not it’s a result of production shortcomings, Bickford’s filmic flourishes are only really in evidence in the aforementioned beach sequence, model shots of the Argolin city and the beautiful, shimmering golden framing of Tom and Lalla looking out over the nuclear wasteland. Which is not to denigrate them, they’re beautiful moments, but it’s hard to escape the fumbled direction and editing of the Part Three cliffhanger or the repeated use of that interminable docking sequence; surely the most egregious use of padding since we saw Patrick Troughton loosen, then tighten, then loosen a screw in a revolver handle in painstaking detail during The War Games. But I’m being churlish, let’s move on to one of The Leisure Hive’s other strengths, our leading man. It’s hard to escape the fact that Tom is not a well man during this season, and he does seem to have aged considerably since the end of The Horns of Nimon. And yet, more than any other story in the season (Logopolis notwithstanding) The Leisure Hive makes a virtue of Tom’s tiredness in the role. Which is not to say he’s sleepwalking his way through his performance, the charm and the wit is still there, the ‘Take me to his mother’ exchange is funny and very Fourth Doctor whilst the reassuring grin after he’s seemingly torn apart takes years off him. However, there’s clearly a concerted effort to give him a bit of an acting challenge, something to do. It’s a challenge Tom seizes with both hands, and his portrayal of the rapidly aged Doctor is incredibly subtle, paring down the gregarious excess of the Fourth Doctor and adding little physical touches, a wince here, a hand gesture there. By the time he appears underneath the helmet at the serial’s climax, Baker appears renewed and refreshed, miles away from the exhausted, deckchair dozer we find at the beginning. Overall then, The Leisure Hive breathes new life into the Fourth Doctor era by taking years off it. As the Doctor and Romana leave Mena and Hardin to continue their inter-species romance and bring new life to Argolis, we get the sense that our favourite show is heading off into new territory. We can expect big science fiction concepts, less goofiness but the same amount of charm alongside a sense of wonder and inventiveness. What we get, is a cactus in a chartered accountant’s suit. Because, in reality, Meglos is more indicative of where 1980s Doctor Who was headed. The Doctor and his companions don’t turn up on Tigella until halfway through the story, and in the meantime, we’re forced to endure a huge cast of supporting characters we’ve never met before delivering reams and reams of expository dialogue. Thankfully, one of those characters is played by Jacqueline Hill, arguably stunt casting by JN-T, but never less than magnificent as Lexa. And at least the prolonged TARDIS scenes have a dramatic purpose within the overall story, keeping the Doctor and Romana out of the way whilst Meglos pilfers the dodecahedron. Ironically, had Douglas Adams script edited this story of a sentient cactus possessing a chartered accountant and commanding a band of alien mercenaries, we would probably have had something far more memorable. It’s not a huge stretch of the imagination, therefore, to see The Leisure Hive’s influence on Brooker’s Black Mirror, especially those more technologically fearful Netflix episodes. So there we have it, indirectly, John Nathan-Turner has influenced one of the 21st century’s most globally successful TV series, which is itself now pushing the boundaries of contemporary storytelling by dabbling in choice-driven storytelling. It’s like the Doctor says, always accept the unexpected. I love David Tennant. There is something about the man himself that seems to be so enthusiastic, gregarious and just being an all-around lovely bloke. David Tennant isn’t shy about saying he is a lifelong fan of Doctor Who. It influenced his decision to become an actor and he doesn’t seem to be able to put a foot wrong with the work he does. Besides being the 10th Doctor he’s known for his detective in “Broadchurch”, playing “Casanova”, playing a mind-controlling comic supervillain in “Jessica Jones”, starring in “Harry Potter” as well as an accomplished theatre actor for the Royal Shakespeare Company. I notice the first four spots on the survey of most popular Doctor actors are 6.1ft or above and when I saw David Tennant, in the London theatre production of Don Juan in 2017, what struck me there is something very energetic about the way he moves. Perhaps it’s his actor’s training to know how to use his tall frame so that his physicality dominates the room. This suits the character of the doctor to a tee who is a larger than life personality It certainly helps to be able to create an immediate authority when the Doctor enters a space. When the 9th Doctor was regenerating it could have been problematic for the programme. Having Christopher Eccleston’s performance secure a second series was a fantastic achievement. Those new fans captured in the first series could have been unwelcoming of the change. However, Russell T Davies, who is a very clever man, knew how to bring in the new Doctor in ‘The Christmas Invasion’ using Rose’s early confusion and distress as the pivot. The companion mirrors the audience viewpoint so exploring whether she and we would accept him. There is a crucial scene when the 10th Doctor wakes from his post-regeneration coma, realised by Rose’s speech with a shot of David Tennant ‘s Doctor framed in the doors of the Tardis ready to fight and defeat the Sycorax. It’s such a triumphant moment. It harks back to the classic series as Doctors recover from regeneration and confirmed David Tennant as a continuation of the same character first introduced to Rose and also the audience. The imagery of having him using a sword (a traditional hero object) harked back to the 3rd and 5th Doctors also using a sword (against the Master) and reinforced the courageous nature of the Doctor. David Tennant never played up to his good looks but he was probably the first conventionally “handsome” Doctor (in a geeky kind of way with his specs) of the revived series. Even Cassandra in “New Earth” described him as ‘slim and a little bit foxy’. Offered the role of the Doctor by Russell T Davies partly based on playing the lothario Giacomo Casanova it was perhaps inevitable David Tenant’s previous role would pull inspiration for his doctor. Christopher Eccleston had certainly made an impact in the first series with his own brand of Doctor but the 9th doctor was so haunted by his actions in the time war, full of guilt and anger that it didn’t allow for anything softer to be explored bar a brief flirting with Lynda with a Y. This approach of a more romantic Doctor was a stroke of genius. 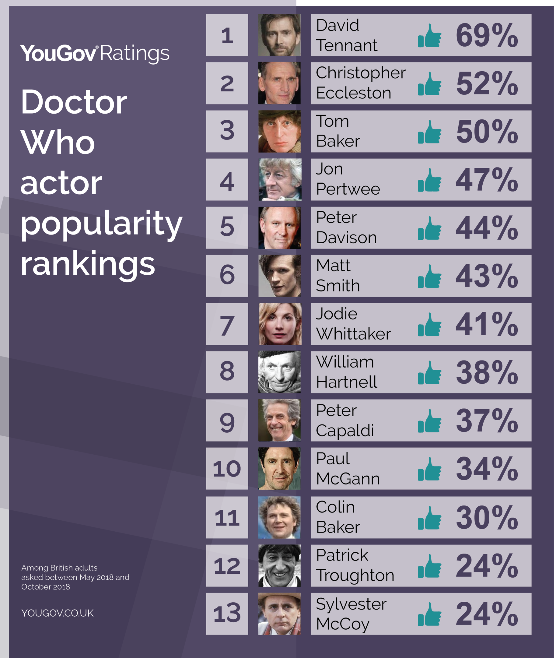 Doctor Who was at the height of popularity among a general audience during Tennant’s run. The programme had just come back with a popular first series, so people tuned in for Tennant’s run. RTD didn’t shy away from portraying the 10th Doctor as a man with human type frailties and you can see David Tennant grabbing the opportunities in the scripts to show a less awkward, charismatic, boyishly enthusiastic outwardly easy-going Doctor. Those traits enabled the 10th to explore a more adventurous passionate side to his own nature which also brought along the general audience rather than just fanboys. Although he declared to Rose in ‘School Reunion’ that his lifespan meant he couldn’t get involved, as human lives are so fleeting, the Doctor would still allow himself to be drawn to and led by strong women i.e. creating a mind meld connection with Madame de Pompadour, the shy bumbling master flirting with Joan Redfern in “Human Nature” or planning picnics with Elizabeth the First. When he saved River to CAL this made the 10th Doctor so much more relatable to the audience as a romantic hero. As a departure from the original classic series rules, where the Doctor had always taken a more paternal disposition towards his companions it was slightly uneasy for classic who fans such as myself to see the romantic direction that the writing took with Rose and the Doctor being thrown together. But it chimed with the audience where the 10th Doctor exhibited such simple joy in just travelling that it was very easy for his companions to be swept along and fall in love with him. The scene in “New Earth” where Rose and the Doctor are lying in the bluegrass just talking at the beginning of Series 2, watching the spacecraft arrive feels reminiscent of two lovers or very close friends with a shared sense of humour and a close chemistry. Billie Piper and David Tennant just worked so naturalistically together that it reflected in the ease of their characters and the general audience lapped it up. He was the first new series Doctor who stayed for three series which gave enough time for a fan-base of young boys and also importantly a new female fan-base, who wouldn’t normally be attracted to a science fiction show to watch and grow up with him. A legion of Tennant fan-girls swooned! His first series had viewers of up to 9.24 million, the second series up to 8.71 million, the third 10.57 million. His Christmas specials are the only ones to hit 13 million viewers for the holiday period. What also made the 10th doctor era a successful one was the companions he was paired with. As companions, they weren’t wrapped in a mystery like the later Matt Smith era but their presence played the part of a mirror to faults in the 10th Doctor or facilitated ways for changing the Doctor for the better. The writing for the companions did contain an element of ‘soapiness’ which spoke to the emotions of the audience. But as a dramatic device, it allowed interesting avenues to be explored on the experience of being a companion of the Doctor and also of the impact of travelling with him. Martha was the rebound companion after Rose who then chose to leave the Doctor because he couldn’t reciprocate her feelings but some companions were dropped off and just left hanging. in ‘School Reunion’ it was very interesting and new to see Rose feeling confronted by meeting Sarah Jane and also exploring Sarah Jane’s feelings. Rose understanding that she wasn’t the only woman to have been important to the Doctor, added a more mature dimension to their relationship. The impact of Rose on the Doctor can’t be underestimated really Her presence opened up the Doctor to new hope that he wasn’t really alone. He acknowledged that she had made him a better person and in “Journeys End” the fact that humans and Timelords will have different life spans, meant the only gift in his power was to leave Rose with a human Doctor to live with. You were born in battle, full of blood and anger and revenge. Remind you of someone? That’s me, when we first met. And you made me better. Now you can do the same for him. High profile companion actors such as Catherine Tate were prejudged by the fans before they joined and she surprised everyone with how good she was. Donna Noble was an influencing factor on the 10th Doctor’s actions probably more than any other companion. In “The Runaway Bride” if Donna hadn’t been there to stop him the Doctor would have stayed and died with the Racnoss when he flooded the underground tunnels with water. DOCTOR: I don’t need anyone. DONNA: Yes, you do. Because sometimes, I think you need someone to stop you. David rose brilliantly to the challenge showing with the growing losses of River, Rose. Joan, Renette how detached the Doctor had become. The 10th and Donna dynamic allowed the series to explore moral dilemmas which would take the Doctor along a darker road during series 4 and later the specials. What I do enjoy is that Donna was always allowed to challenge the Doctor’s long-held beliefs. Although not a conformist by nature the Doctor, as a Timelord, he was aware of the events that could be changed and those that were fixed points. In the story “Fires of Pompei” where she begged the Doctor to save someone is a truly touching moment and it established that the Doctor was able to break the rules if he wanted to. DONNA: What, and you’re in charge? DOCTOR: Tardis, Time Lord, yeah. DONNA: Donna, human, no. I don’t need your permission. The combination of Russell T Davies and David Tennant together was a dynamite partnership. With some brilliant planning from Russell, David Tennant managed to balance all the different aspects of his Doctor in a consistent way over three series. David Tennant was very versatile with a deft touch when it came to the more comedic aspects of the scripts but was then able to swiftly switch to drama effortlessly. There were various themes explored during the 10th Doctor era such as the Doctor being last of his kind, seeking to fill that void unsuccessfully. Yes, the 10th Doctor bounced around all happy abandon fizzed with energy and enthusiasm but David was also able to show the huge loneliness of the character. His interpretation would suffer losses and have to say goodbye. Rose lost on a parallel world time, River and Renette dying, Joan telling him to leave, having to kill Donna’s memories. David Tennant was able to show a much more emotional Doctor than his predecessors. The scene where the 10th Doctor begged the Master to regenerate and held his body is a very 10th Doctor moment and I couldn’t imagine any other new who actor besides David Tennant allowing his Doctor’s emotions to show in quite such an openly tearful way. With the words ‘no second chances. I’m not that kind of man’ from “The Christmas Invasion” set up from the beginning that this interpretation of the Doctor had an inner ferocity which carried through from Christopher Eccleston’s era. In “Human Nature” where he’s converted to a shy human, man how good is David Tennant with a magical script showing, on the one hand, a stubborn resoluteness, to stay as he was and live a normal human life but then training the boys to fight scarecrows or allowing Jenkins to be thrashed by his contemporaries. It exposed the 10th’s character as still the damaged man from the atrocities of the Time War aware of the collateral damage he inflicted and left behind. He couldn’t allow for mercy fighting his enemies. 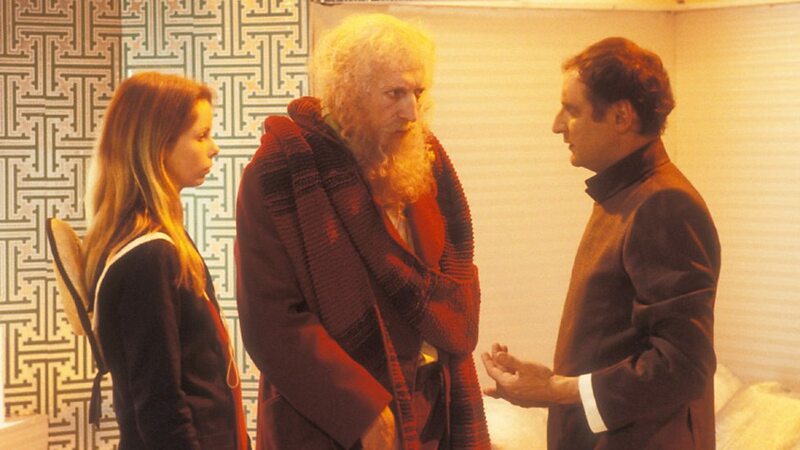 Baines described the ‘fury of a Timelord’ as he meted out an everlasting punishment on the family. Davros described him as the destroyer of worlds. DOCTOR: Don’t play games with me. You just killed someone I liked. That is not a safe place to stand. I’m the Doctor, and you’re in the biggest library in the universe. Look me up. In “The Fires of Pompeii” the immediate consequences were the Doctor saved four people who wouldn’t have been alive otherwise due to Donna’s influence but without her, it created the opportunity for the later darkness of the ‘Time Lord Victorious’ where he tried unsuccessfully to save Adelaide Brookes and her crew. The contemplation of the 10th Doctor as a god in “The Waters of Mars” when he is on his own is a twist I never expected and it’s something I wished could have been explored for a little longer in the series. I loved the shade that David Tennant brought to those final scenes with Adelaide Brookes. I like to think that the reason his Doctor became that way was he feared the prophecy of his own death felt the weight of seeing other people die and just wanted to use his knowledge to change the outcome. The end of the 10th Doctor era really gave David Tennant a chance to shine with the quiet simplicity of him saving Wilf from the chamber, his acceptance of his fate and the goodbye to his companions. I’m not sure if I enjoyed the sorrow of his ‘I don’t want to go’ moment but it was typical of his Doctor, which had a melancholy underneath the easy-going surface. A more human sorrow than previously. The “David Tennant does a Podcast with…” Series. • Olivia Coleman – Oh my gosh what a brilliant choice for a first podcast! From the moment “Coley” enters with her dog Alfred and is bantering with DT she seems modest and grounded. I am totally in awe of Olivia Coleman! Have ever listened to Desert Island Discs on Radio 4 where guests are interviewed about their lives and choose favourite music to take to a desert island? I always find with that the interviewer is a bit gushing about the guest but here DT, because they are friends, is able to tease an intimate portrait of Olivia Coleman from her without it coming across as anything other than relaxed and comfortable. His boyish wonder at her eating a cigarette she had to “sell” for a theatre audition or the shared dislike of prima donna actors is warmly engaging. Olivia Coleman would have made an absolutely fantastic Doctor. From a very good performance in the “Eleventh Hour “as Mother ” I think she inhabits her roles with an interesting intensity. I read somewhere apparently Chris Chibnall asked her to be the Doctor but she turned it down which is a real shame. I can understand why from her stated a dislike of the paparazzi. David Tennant himself acknowledges that being the Doctor does bring worldwide scrutiny and interest nowadays and it requires adjustment. I suppose the life of an actor is more about the character parts they play, the art of acting and she just wants to do that. We’ll never see her as the Doctor now but I’m so happy for her that her star is in the ascendant with both a BAFTA and an Oscar for “The Favourite”. • Whoopi Goldberg – Interviewing Whoopi Goldberg doesn’t seem like an obvious choice for a second slice of the podcast but the contrast to the first podcast is evident. She’s an intelligent actor who learned her craft in various theatre groups in San Francisco and New York her life seems to have been full of fortuitous moments. She has been in the right place at the right time being spotted doing a one-woman show by director Mike Nicholls which then transferred to Broadway or receiving a purple envelope from Alice Walker which led to her breakout role in the film “The Colour Purple”. David Tennant seems a bit in awe of Whoopi keen to put her at her ease so her swearing definitely isn’t frowned upon. She doesn’t have any pretensions, is funny and is refreshingly down to earth-conscious of the distinction between her private persona and the responsibility to be in public ‘Whoopi Goldberg’ to her fans. • Ian McKellen – An actor with a very dry sense of humour what is interesting is how much he has liked to challenge himself. He seems to love the life of an actor for much of his life preferring to be in disguise because it gave him the freedom to act but this seems perhaps a symptom of the times he lived through where being gay was illegal. Coming out in his late 40’s he describes the relief of coming out and how it has motivated his political life. 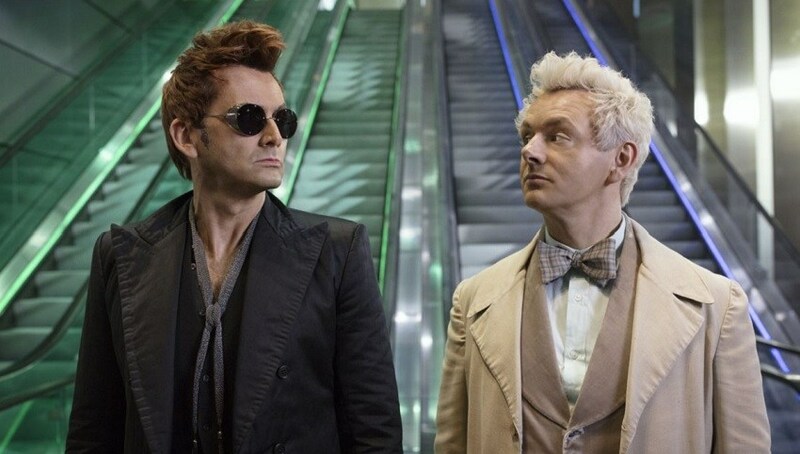 For sci-fi fantasy lovers David Tennant is soon going to be starring in Good Omens playing a demon on Earth (based on Terry Pratchett’s darkly comic novel) which is coming to Amazon Prime in May. The tv production is being brought to the screen by writer Neil Gagman who collaborated with Terry Pratchett on the novel and who wanted to create a version that would honour his friend. Also, starring is Michael Sheen, who voiced House in “The Doctor’s Wife” so it should be a really interesting watch. 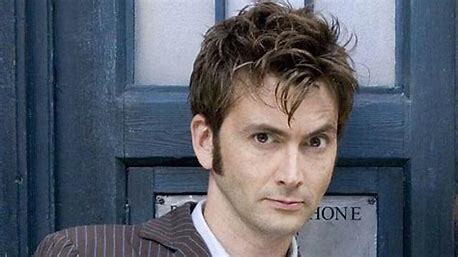 What are your thoughts on the 10th Doctor or David Tennant? Post your thoughts on here or on Twitter. Let’s talk.